June is looking to be a busy month here at Mt. Hood Adult Day Center. Check out the monthly newsletter to get in on the action. Get your loved one signed up for Memories in the Making. Memories in the Making is a watercolor group for individuals experiencing early onset dementia whose goals are to have fun and enhance communication through art expression! All materials are included and no previous art experience is needed. 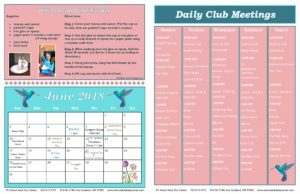 Our Activities Coordinator, Julie Roberts will be leading the group that meets 1 time per week, starting July 10th, 2018. Be on the lookout for the flyer, coming in the next couple weeks, with more information. We are also kicking off “The Longest Day” in honor of those affected with Alzheimer’s Disease. 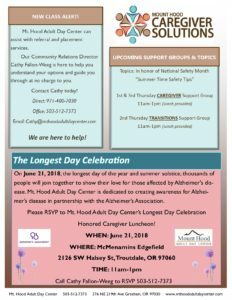 On June 21, 2018, the longest day of the year and summer solstice, thousands of people will join together to show their love for those affected by Alzheimer’s disease. Mt. Hood Adult Day Center is dedicated to creating awareness for Alzheimer’s disease in partnership with the Alzheimer’s Association. 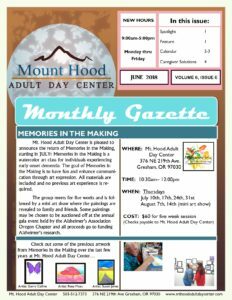 You can also visit our website at mthoodadultdaycenter.com or like us on Facebook: https://www.facebook.com/Mt-Hood-Adult-Day-Center- to keep update on current events!